The graph below shows the population change between 1940 and 2000 in three different counties in the U.S. state of Oregon. It'd be nice of you if you help me and correct my mistakes to avoid making any in my IELTS exam. thank you so much. The line graph compares the change of population in the counties of the state of Oregan from 1940 to 2000 as indicated on x-axis. The y-axis shows the number of people in thousands from 0 to 255 thousands. According to the legend, Columbia was described by the green line, Yamhill the blue, and Washington the yellow. 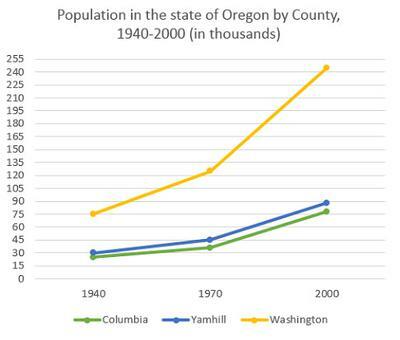 In 1940, the number of Columbia's and Yamhill's population were around 30 thousand, Whereas Washington's was about 75 thousands, approximately 45 thousands more people than Columbia and Yamhill. From this time, the population of Washington climbed slightly to over 120 thousands. Likewise, Columbia at 35 thousands and Yamhill at 45 thousands oin 1970. By 2000, there was a sharp increase in the number of Washington's population to 240 thousands. In contrast, the population number of Columbia and Yamhill rose steadily to nearly 60 thousands and 75 thousands, respectively. In conclusion, there was a huge increase in Washington's population. whilst Columbia's was the lowest comparing with Yamill. or should i devide them by time periods. It would be fine to do it the way you suggest. That's probably the best way - makes it very clear and means you can compare them.